Why Neck Laser Hair Removal? Pesky neck hair isn’t an annoyance experienced only by men; many women are plagued with unwanted neck hair too. The hair can range from thick, dark and coarse to fine, light and thin. The hair on the neck can also grow in various patterns on the neck. Getting laser hair removal for neck permanently reduces the amount of pesky hair growth for the patient. In men, hair patterns are predominately seen on the front and back of the neck. The pattern on the front of the neck begins just under the chin down to the Adam’s apple or even down to the collar bone. The area on the back of the neck, extends from the hair line down to the top of the back. This is the area that tends to get unruly between haircuts. Having neck laser hair removal on the front and/or back of the neck reduces the occurrence of ingrown hairs often associated with PFB (pseudofolliculitisbarbae) and to maintain a groomed appearance in between haircuts. It can be attributed to hormones, as seen in the front region of the neck or ones ethnic background which is commonly seen on the back of the neck in many Asian and Indian ethnicities. For women, hair growth on the neck can be very embarrassing. Because it cannot be covered by makeup and clothing easily, many women take to plucking, waxing or threading for temporary relief of their hair problem, but this can cause other annoying problems like ingrown hairs and skin discoloration. Neck Laser Hair Removal in Atlanta is a simple way to renew your confidence by getting rid of the problem. 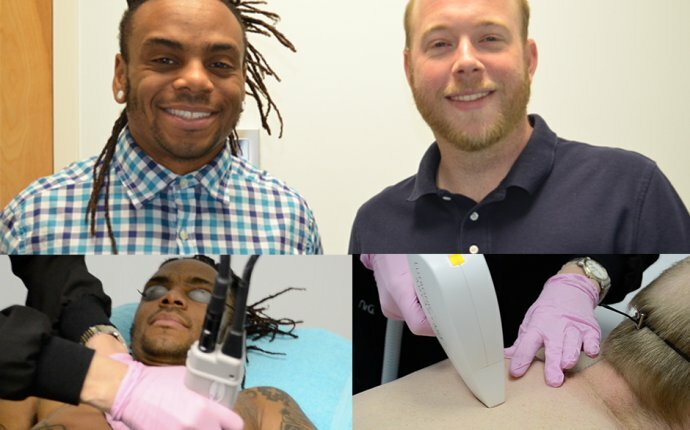 To learn more about the process visit our page on the laser hair removal procedure.